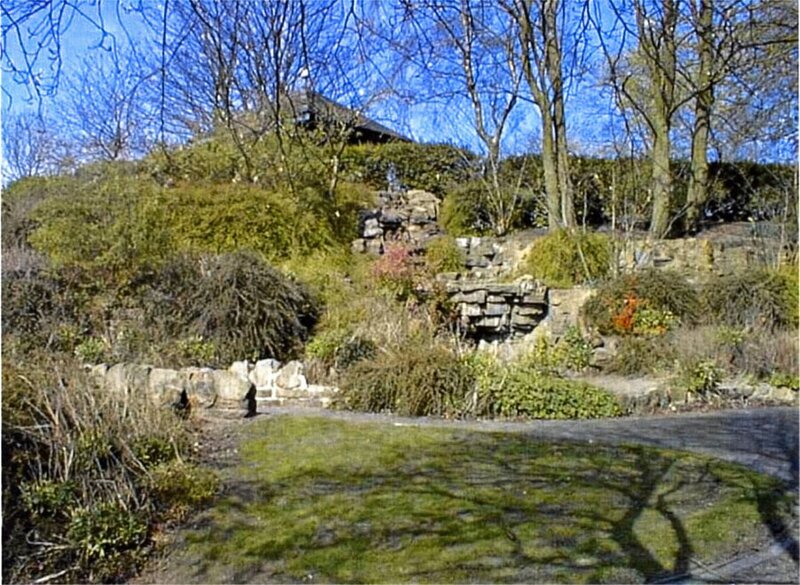 At about the same time that he was completing his commission at Belle Vue Park, in Newport, Monmouthshire – see Chapter 20 in Rock Landscapes: The Pulham Legacy – Thomas Mawson was awarded contracts for the design of Hanley Park and Burslem Park in Stoke-on-Trent, Staffordshire, for which he again involved the Pulhams for the construction of some rockwork features. 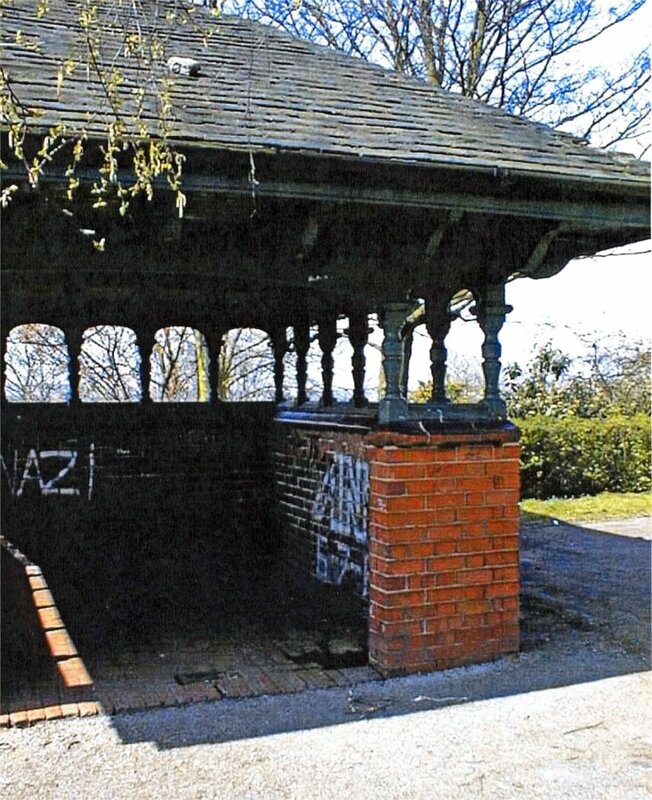 The creation of Hanley Park was first discussed when Hanley was incorporated as a Borough of Stoke-on-Trent in 1857, but it was not until 1890 that the idea was finally approved at a public meeting. The reason for this delay was because the land concerned was largely undeveloped, and consisted of old pit shafts, enormous spoil heaps, and tips of pottery refuse interspersed with the remnants of hedges identifying earlier field boundaries – a daunting prospect for any landscape architect! Thomas Mawson was appointed by Hanley Borough Council to transform about 80 hectares of this land into a public park, and the rest of the land was to be laid out as building plots. He tackled the project with his characteristic enthusiasm, and later wrote of all the land problems with which he had to contend, and the unhelpful views southwards towards the nearby industrial town of Stoke . . . Following its opening, the park became the main social centre for the people of both Hanley and Stoke. As well as being used as an area for weekly promenading, it also became the main venue for the annual shows – it hosted the Hanley Park Fête from 1897 until 1939, as well as the annual Horse Parade and Hanley Flower Show. Mawson’s original plan for a section of Hanley Park is reproduced in Fig 1. 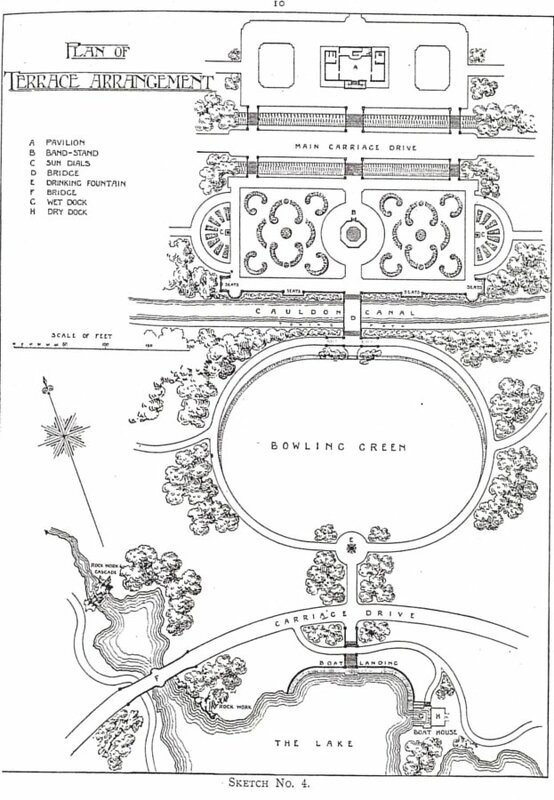 This shows very clearly how he intended to blend the formal terrace – which is actually in the middle of the overall plan, and has Pavilion ‘A’ as its centrepiece – with steps down over the Main Carriage Drive to the formal gardens, with a bandstand at its centre. There is then a bridge over the Cauldon Canal, with more steps leading down to the Bowling Green, around which is a path, with a southern arm that leads down to a secondary Carriage Drive. This, in turn, has another arm that leads down to the Boat House on the shore of the lake, but, if one ignores this, and continues on down the drive – towards the bottom left corner of the map – one passes an area of rockwork on the left, just before arriving at a bridge over an arm of the lake. 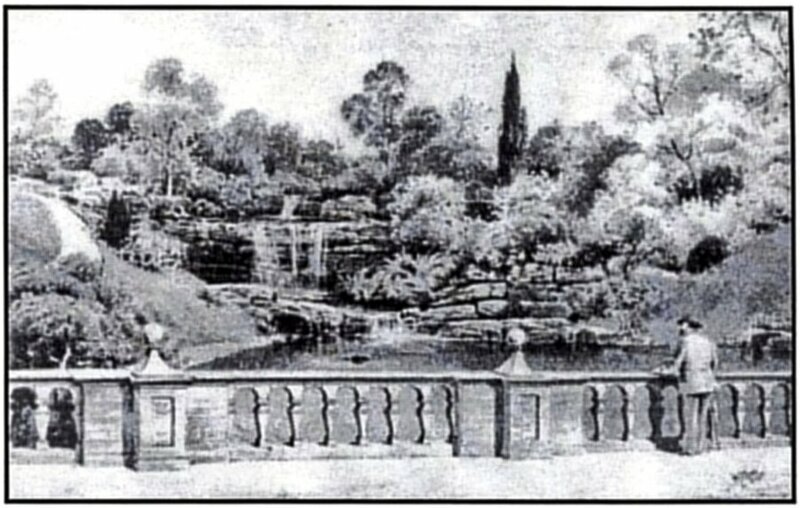 Mawson was obviously a great believer in the use of rockwork in his gardens and parks, because he even included a sketch of his vision of the Hanley Park cascades – as viewed from the bridge – in his Report. It is reproduced here in Fig 2. ‘It will be seen from my plan and sketch (Fig 2) that I propose to make considerable use of rockwork, as it is most valuable in giving variety and colour to positions otherwise uninteresting. The principal use I should propose to make of it would be in the arrangement of a dropping well, miniature waterfalls, and cascades. I should also use it in breaking up margins of lake, and in the formation of boulders, and it might also be used with advantage in giving character to lawns. ‘In the formation of this rockwork, I propose to use anything which could be built into large masses; furnace slag covered with cement would answer the purpose below water-line, with natural stone above water-line, worked into stratifications and boulders. In this work it would be necessary to employ a rock builder, who would, under my direction, imitate any natural stone. Of course, I should prefer natural red sandstone throughout, worked into stratifications, if it could be procured at a reasonable price. 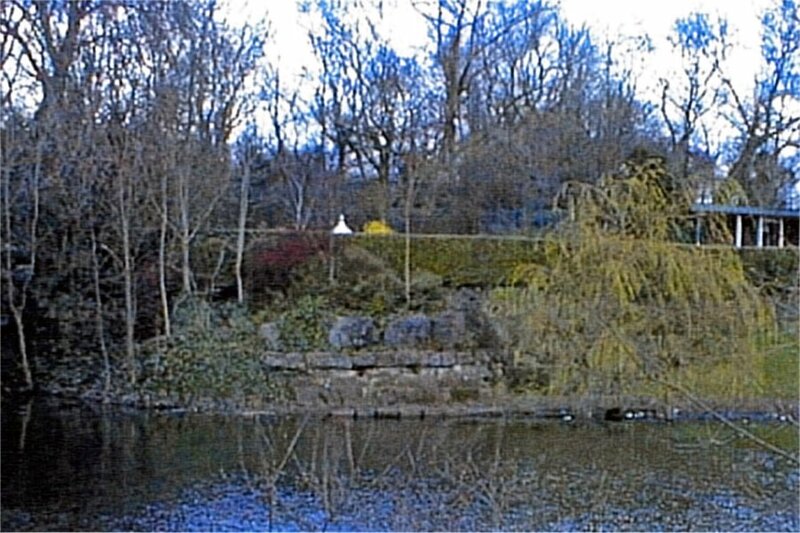 A picture of this scene as it appears today is shown here in Fig 4. The description of ‘Tea House’ is apparently somewhat ambitious, however, because this building has only ever been regarded as a ‘shelter’ – and quite a small one at that, as indicated by the picture in Fig 5. It may look a little reminiscent of some other Pulham structures, but it is hardly large or significant enough to attempt to make claims as to its provenance here. Posted on August 1, 2014 June 4, 2016 by Claude HitchingPosted in Sites Month 2Tagged . . James Pulham and Son, Burslem Park Stoke-on-Trent, cascade, Hanley Park Stoke-on-Trent, thomas mawson, Thomas Mawson Plan, Thomas Mawson Sketch. Next Next post: People and Places Featured in . . .